Has the Summer Left You High and Dry of Wine? I know if you are like me, the summer was filled with grilling, dinner parties and lot’s of drinking with friends. Although I had a grand time, it left me high and dry of wine. Look, I cannot complain, having friends over drinking roses, Albarinos and some of my cellared bottles was a great way to spend the summer. It has unfortunately left me dry of wine. This led me to go back to work and start scouting some good wine buys. I met with my purveyors and started looking for wines I could buy and take home. During this time I started to visit some of the other restaurants in my company and realized that they had way too much wine sitting around. I twisted a few arms and convinced them to send their wines to Island Prime where I could sift through them and offer a ridiculous prices for our Prime Cru members. We are a week away and I have loads and loads of vino ranging from cheap California everyday drinking wines to old world staples, such as Barolo and obscure ground breaking wines, such as Sadie Family. There is something for every palate. I know that when I get there in the morning and start to pull apart boxes I am going to pull aside some roses for myself. Although summer has ended, we still have a few more months of sun here in San Diego. 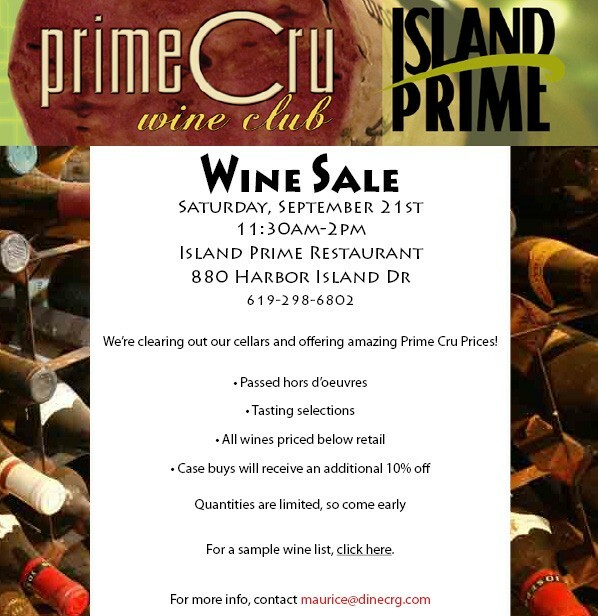 If you never been to a wine sale at Island Prime, then you are missing out. It only lasts 2 and a half hours and wines move very fast. When you arrive be sure to grab a box, a wine glass and don’t over think your purchases. The moment you begin to contemplate a wine, and you let go of it, there is no guarantee it well be there when you return. Wines go fast. The moment the room gets a buzz about a wine we tasted, that wine is gone, gone, gone. Yes I said tasted. You get to taste while you shop. We have samples of many of the wines for you to make a better choice. While you shop, taste and get blown away by the view of the San Diego bay, you can also enjoy some light hor d’oeuvres. These wine sales are the best way to spend a Saturday afternoon. When you finish shopping and you get the urge for a serious lunch, you can make your way over to the C-Level lounge and enjoy lunch on the patio. The best part is you can take your new purchase and open it at your table without a corkage fee. So if you are like me and summer has left you high and dry of wine, then this is the time to replenish your cellar.